﻿ Allowdale Herefords » MAIN PAGE» Pedigree Hereford Livestock Breeders » Bulls and Heifers available for Sale and Export "Cattle R Us"
Allowdale Herefords are based in Co Cork, Ireland and have just over 85 breeding cows, and a number of embryo recipients in Cork, from embryos from cattle in residence in Canada and the United States of America. We are members of the Irish Hereford Breed Society, members of Munster Herefords Branch of the Irish Hereford Society as well as the Irish Hereford Breed Improvement Programme. Overseas Memberships of Australian Hereford Society and Canadian Hereford Society . Established in 2006 with purchases from well established and well recognised Irish , Northern Irish, United Kingdom , Canadian & American breeders such as Badlingham Herefords, Border Herefords, Ballyaville Herefords, Ballymartin Herefords, Balleen Herefords , Breaney Herefords, Drummurry Herefords, Free Town Herefords, Gageboro Herefords, Grianan Herefords, Haven Herefords, Hirsche Herefords, Lillybrook Herefords, Moyclare Herefords, Pallas Herefords, Star Lake Cattle Ranch, Trillick Herefords, Westwood Herefords & XTC Herefords. 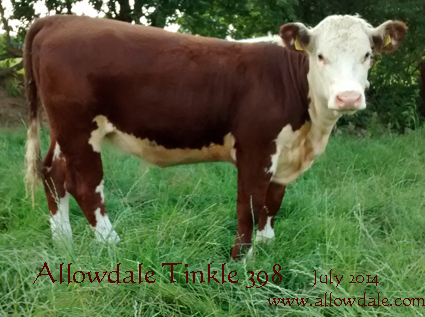 Allowdale Herefords believe that Hereford cattle will continue to command a premier spot in the beef cattle industry for years to come due to efficient utilisation of grassland and arable bi-products, at the same time as producing high quality beef. We selected the Hereford breed in particular due to the fact that Herefords were founded some two and one-half centuries ago as a product of necessity, by thrifty and enterprising farmers, who were determined to produce beef for the expanding food market created by the industrial revolution. 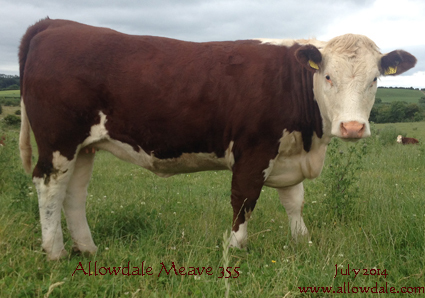 Allowdale Herefords believe that beef production has to be based on natural accessible environmental means which are plentiful in Ireland. 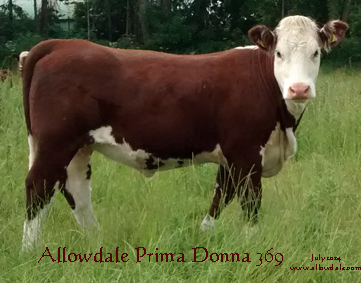 We invite you to browse our site and contact us +353-87 61 36 750 or Herefords@Allowdale.com if you have any questions or would like to discuss Pedigree Hereford breeding !